On 4 December Massimo Giustetti, retired bishop of Biella, passed from death to full life in Christ. Our community remembers him as a father rich in the capacity to love and to be loved, rooted in the Gospel and moved by the Spirit — a pastor capable of leading the faithful in Christ’s footsteps, in the light of the “new Pentecost” of Vatican II. 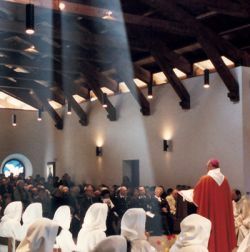 From the very beginning of his episcopal ministry in Biella in January 1987 he wanted to show his fatherly friendship, receiving us fully into the local Church that the Lord had entrusted to him. Even recently, shortly after having celebrated the 40th anniversary of his episcopal ordination, he joined with the community for the fraternal meeting in Bose with the Archbishop of Canterbury.